When NBC announced the broadcast teams for its upcoming Super Bowl LII coverage, the name missing from the network’s studio pregame show attracted the most attention. Dan Patrick and Liam McHugh will host, along with analysts Tony Dungy, Rodney Harrison, Mike Florio and Chris Simms. Where was Bob Costas? It was nearly impossible to imagine NBC broadcasting a marquee sporting event without the face and voice so many of us associate with the network. Costas’s absence from the on-air lineup immediately led to speculation as to why that might have occurred. The dots that many immediately attempted to connect were Costas’s recent “this game destroys people’s brains” remarks at a University of Maryland seminar that cast a bleak future for football. Did NBC pull Costas from its Super Bowl coverage to appease any concerns the NFL may have had about his outspokenness against football’s dangers, especially regarding the safety of young people playing the sport? As tantalizing as that possibility may have been, however, the actual reason for Costas sitting out NBC’s Super Bowl coverage is much less sensational. Initially, Costas explained that Patrick and McHugh have hosted NBC’s studio shows throughout the season, and deserve to maintain the same roles for the Super Bowl. But Costas sitting this one out also had more to do with his feelings about football, as he told Sports Business Daily’s John Ourand via email. Costas elaborated on those “ambivalent feelings” further to Ourand, which you can read at SBD. But he also made a point to clarify that this isn’t a sudden change of heart for him. In addition to speaking out on the debilitating effects of football, he’s also shared his thoughts on NFL player protests and the outrage directed toward them. Shortly after the 2017 NFL season began, Costas could be seen across many different outlets — such as CNN’s New Day and HBO’s Real Time with Bill Maher — for long discussions on Donald Trump’s remarks about players kneeling during the national anthem. 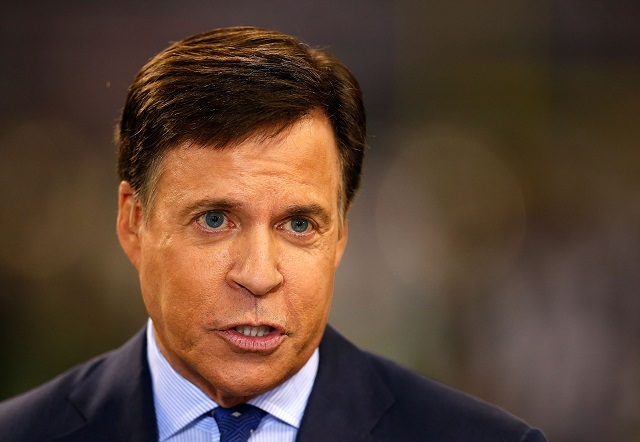 Such a prominent role on NBC’s NFL coverage has often put Costas in the position of being a spokesperson on football — or at least being perceived as such — when certain topics are in the national topic of conversation. At times, he’s been comfortable with speaking plainly and candidly about the sport, but it appears that it’s a position with which he’s grown increasingly uneasy and would prefer not to be in that role during the NFL’s showcase game.